"The Human Body has not more need for cow's milk than it does for dog's milk, horses milk, or giraffes' milk"
none show more passionate tenderness to their young when deprived of them and, in short, I am not ashamed to profess a deep love for these quiet creatures"
The natural life expectancy of cattle is about twenty years or so. Contrary to popular belief cows are intelligent animals. According to researchers they have good memories, never forgetting a place or a face; they can get excited when they solve an intellectual challenge; they have cognitive abilities and understand cause and effect; they have the ability to learn from one another and have a complex social system, choosing friends and leaders. Cows have personality traits, a whole range of characteristics as varied as your pet cat or dog and indeed yourself. Just like us some are friendly, whilst others are aggressive. Some are devious and bold, while others are shy and nervous. Some are completely indifferent - and who can blame them considering how they are treated by us. Cows are highly social animals, they form friendships and have close bonds with family members and are very maternal, they grieve terribly when their young are taken from them as you will read later. Did you know that when a heard of cows settle down for a nap they position themselves according to their status in the herd. In fact very much like us social relationships influence many aspects of their daily lives. Also similar to us if we were penned in with people we do not know and crammed into a tiny space, cows become stressed and aggressive towards one another fighting for dominance. This is because cows in factory farms cannot live in accordance with their natural social inclinations. Cows like to be with their families and friends, and live in accordance with their social hierarchy. In the confined conditions in factory farms this is not possible. The dairy cow is raised to produce milk not beef, she is kept constantly pregnant in a continuous and exhausting cycle of misery. Within two to three months of giving birth cows are impregnated again, mostly by artificial insemination. As lactation lasts around 10 months the cow is simultaneously pregnant and lactating for 6 to 8 months during each calving cycle. Cows have a 6 to 8 week period between lactation ceasing and their next calving. In order to provide you with milk, a food that we like every other mammal no longer needs after weaning, she is milked two or three times each day and often much more frequently as you will read further down. Her calves are taken away within twenty four hours after the calf has taken the colostrum, which in all animals protects the young one from disease. However the calf is removed before he or she can have any of the milk which must all be kept for humans, a calf never has any of his or her mother's milk. Cows are good mothers, they are severely traumatised when their calves are taken away from them, they can bellow for days. In his book, The Pig Who Sang to the Moon Jeffrey Mason tells of an account given him by an RSPCA officer concerning one particular cow, who was considerably distraught for a period of six weeks by the loss of her calf. When the calf was removed she was beside herself with grief, gazing into the empty pen bellowing for hour after hour, only moving when forced to do so. Even after six weeks she would stare into the pen, it was as though her spirit was broken as she gazed into the pen in the forlorn hope that she would find her calf there. Because of man's interference a cow will produce as much as 7,000 litres of milk each year, an enormous amount far in access of that required by her calf, and three times the amount produced a century ago. This drastic increase is the result of injecting the cow with growth hormones to produce more milk. An outrageous and inhumane abuse of another living being; treating a cow as though she is nothing more than a milk producing machine, spouting milk rather like a spring spouts water. A male calf is only kept with his mother and reprieved from almost immediate slaughter if other than for breeding he is being raised for meat, the least intensive is the suckler method. The calf is kept with his mother until weaned and than fed on grass and no doubt growth hormones for a couple of years to put on wieght before being slaughtered. More intensive methods involve the calf being taken from his mother at birth and reared in a pen on replacer milk and pellets. Eventually these unfortunate creatures will be taken to fattening sheds, which may confine as many as 8,000 animals crammed into stalls to stop them moving around and wasting energy, and fed on high quality cereals. Straw beds may be provided but many have to stand on slatted flooring which is difficult to stand on and results in lameness. In the first week of life calves are castrated, their horns are chemically burnt. In this way they gain wieght quickly and are slaughtered at only 11 to 12 months. My perspective of veganism was most affected by learning that the veal calf is a by-product of dairying, and that in essence there is a slice of veal in every glass of what I had thought was an innocuous white liquid - milk. Male calves who are unsuitable to be raised as beef are reared for veal. The rearing of these calves for veal is one of notoriously dreadful cruelty. The much sought after requirements of veal is that the meat is soft and that it is white. In order for this to happen calves raised for veal are kept in the dark fed only on liquids which keeps their flesh soft, and deliberately kept anaemic by being fed on food low in iron. This results is chronic diarrhoea, which continues until they are slaughtered. This is done to make the meat white because this is what consumers require. 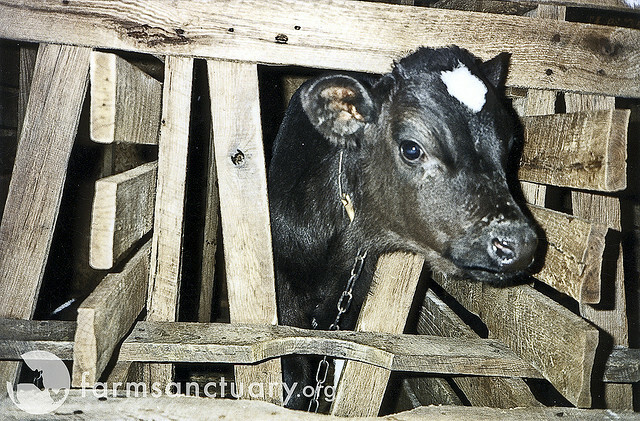 In many countries, but not here in the UK, in order to prevent the young animal from expending too much energy, calves reared for veal are kept in a wooden slated crate which is little bigger than himself with no room to turn round or to lie down, this enforced immobility keeps the flesh tender. Here is what a veal crate looks like. The poor creature has no room to move, here he suffers this miserable confinement before being killed at about 18–20 weeks of age. This is the sum total of his life's experience, he will never walk on grass, feel the warmth of the sun or suckle from his mother. Photo from Farm Sanctuary's Flickr Photostream, Veal Production. Click the link to view more photos. However here in the UK where veal is not as popular as it is in main land Europe, keeping calves for veal caged in this manner has been banned. Most people are however unaware of the abuse that takes place in order to provide veal. Many people will immediately stop eating veal when they become aware of the treatment to the calf. Selectively bred, genetically manipulated, and fed with concentrated feeds and hormones a cow produces ten times more milk than her calf would have needed to suckle. The dire consequences of over milking result in the painful, distressing and potentially fatal condition of mastitis, an infection of the udder, the antibiotics forced up her udders do little to control the disease: antibiotics to treat mastitis are painfully injected up the teat canal. As a precaution many farmers inject their entire herd. And keep in mind such treatments are not to ease the cow's suffering but rather to improve the cows continued viability as a milk producing machine. Her udders as a consequence of man's interventions are oversized, as many as two thirds of cows become lame from foot and leg disorders that result from difficulties walking due to the huge size of her udders. Often she can barely walk, so heavy and cumbersome are her udders. The dairy cow is forced in the way described above to produce ten litres of milk per day, normally a cows udder will hold only 2 litres. The overload of milk causes the udder to become so heavy that it drags on the ground. I have seen cows in fields with the most enormous udders and in my naivety recall wondering why nature produced such an impediment, such an obvious burden. Of course this is part of the problem, the public ignorance of the atrocities which take place. Furthermore she becomes exhausted and her muscles waste away as a result of the enormous expenditure of energy required to produce these unnatural amounts of milk. After three years of such misery cows are utterly spent, exhausted and many die well short of thier life expectancy of 21 years or more. There is a case of a cow in Ireland living until she was 39, so who knows cows may live longer in the wild than we realise. Those who somehow cope with the exhaustion, survive mastitis and other diseases are in any case slaughtered for their meat after giving birth to as many as eight calves, after between four to seven years of exploitation. Moreover as many as 25 percent of dairy cows are actually pregnant when they are killed. Any modicum of freedom is denied them, instead of standing in grass, in the warmth of the sun and the cool of the breeze they now stand on concrete floors in their own excrement, there is no mental stimulation, they suffer lameness and the misery of mastitis. Such intensive farming results in high levels of stress, disease and psychological damage. Again many people who do not live in the country or make regular visits persist in the delusion of pre factory farming, and maintain a now false impression of the idyllic farm setting, cows grazing in fields tending their young is one of the most erroneous. I have lived within easy access of the countryside for most of my life. My family and I regularly visit the Yorkshire dales and other areas of farming in the north and in Scotland, but it has not been until recently that I questioned why there are so few cows and their calves grazing in fields, and only very occasionally a bull, and I have been a vegetarian for sixteen years and a vegan for two. However few visit the country, let alone question the absence of cattle. Other serious conditions are prevalent due to over milking and unhygienic conditions in which cows are kept, including BSE which I understand was caused by feeding cattle, an herbivore, with sheep's brains . Of all farm animals the cow is the hardest worked. Considered as nothing more than a milk producing machine and stock replenisher, the poor creature lives her wretched life in exhaustion and misery suffering many health problems as a result of this relentless abuse. She produces milk, about 120 pints each day, while she simultaneously nurtures a growing calf inside her womb. To maintain this high level of birth-rate she is forcibly impregnated every year in a manner which is both painful and stressful. And after all that suffering the greatest trauma of all awaits her as her infant is taken from her within a day or two after birth. "The dairy cow is a supreme example of an overworked mother. She is the hardest working of all our farm animals and it can be scientifically calculated. It is equivalent to a jogger who goes out for six to eight hours a day which is a lunatic pursuit.” He states that almost 100 per cent of cows suffer from laminitis - a disease which causes 'great pain to the cow' (MAFF). Tissue lining of the foot becomes inflamed and may lead to ulcers. Professor Webster continues: "To understand the pain of laminitis it helps to imagine crushing your finger nails in the door then standing on your fingertips." Finally after enduring a miserable pain filled life enhanced by the sorrow of being deprived of her calves, exhausted and now spent when her milk and reproductive capabilities have ceased, she is sent to the slaughter house. However her suffering is by no means over. And although it may seem that death brings about a cessation of suffering, death of course is yet another form of cruelty as no creature wishes to end his or her existence, particularly in the horrifying manner meted out in the slaughter house. Prior to killing, cattle are stunned with a device called a captive bolt pistol which drives a bolt into the skull which renders the animal unconscious as a result of brain damage and the concussive blow to the skull. Other devices, a non penetrative stunner, bring about unconsciousness by a concussive blow only to the skull without entering the brain. "If an animal is not accurately stunned or the correct cartridge strength is not used, the stun will not be effective. The EU Scientific Veterinary Committee estimate that around 5 to 10% of cattle are not stunned effectively with the captive bolt - or up to 230,000 animals a year. These animals experience the pain of being shot in the head and will either be stunned again (a difficult procedure) or continue on for knifing whilst conscious." Extract : VIVA'S investigative article: Sentenced to Death The slaughter of Farmed Animals in the UK. These animals have experienced the pain of being shot in the head, and because they will recall this pain it makes it difficult to administer the captive bolt a second time. Do not imagine for one moment that such procedures are not painful, common sense tells you that stunning an animal in such a manner will inflict terrible pain. The delusion promoted that such methods are humane and painless by the meat industry and all those who profit from this heinous trade is a deliberate misconception, it is in their interest for you to believe that the slaughter is 'humane,' when the truth of the matter is that it is anything but. It is a painful and horrific way for a cow or other farm animal to meet his or her death after years of misery and abuse. And of course by now the animal is well aware of her fate, she knows she is to die, her fear is palpable, and is passed on to others further down the line. You can read some shocking accounts further down. As a result of failure to stun more pain and fear awaits the already traumatised animal; many animals will continue along the production line, for make no mistake this is precisely what an abattoir is, and many an unfortunate cows may still be conscious when she has her throat cut and slowly bleeds to death. To control the terrified creature and improve the accuracy of the above method cattle are restrained in a pen or have their heads securely fastened. As you can well imagine this causes stress, in fact I would think extreme fear would be a more appropriate description. Legislation requires that these methods of restraint are used to improve accuracy, however, about 17 per cent of abattoirs do not use a restraint or the restraint is insufficient, with the result that stunning may be ineffective. Other problems with adequately stunning may result from inadequate maintenance of the pistol. Improper stunning may mean the animals is conscious when he has his throat cut. The period of unconsciousness induced by stunning should be longer than the period between stunning and bleeding out after his or her throat is cut. "A number of studies have shown that calves also take longer to lose brain function after throat cutting. Anil et al (1995a) found that responsiveness can be present in the brains of calves for as long as 104 seconds after neck-sticking. Because of this many calves show clear signs of recovery during bleeding out "
"A friend told her that she passed a slaughter house every morning on her way to work( in Perth Australia), and she noticed the cows lined up in the preslaughter pen from where they could see their companions being killed. They where trembling - they could barely stand up they where shaking so badly. They were absolutley terrified. When Muncaster heard this she realised that she could never eat an animal whose ends was so terrible. She became a vegetarian from that day on." "It takes 25 minutes to turn a live steer into steak at the modern slaughterhouse where Ramon Moreno works. For 20 years, his post was “second-legger,” a job that entails cutting hocks off carcasses as they whirl past at a rate of 309 an hour. The cattle were supposed to be dead before they got to Moreno. But too often they weren’t. Under a 23-year-old federal law, slaughtered cattle and hogs first must be “stunned” — rendered insensible to pain — with a blow to the head or an electric shock. But at overtaxed plants, the law is sometimes broken, with cruel consequences for animals as well as workers. Enforcement records, interviews, videos and worker affidavits describe repeated violations of the Humane Slaughter Act at dozens of slaughterhouses, ranging from the smallest, custom butcheries to modern, automated establishments such as the sprawling IBP Inc. plant here where Moreno works." If this is not bad enough frightened animals are controlled by an electric goad, a device that can be used legally. This instrument is designed to inflict pain, this is what it is intentionally designed to do, and is used on the hind quarters of pigs and cattle if they refuse to move forward. To add further to the shocking reality exhausted dairy cows are sometimes subjected to a final painful experience before they are killed. It is becoming increasingly common for trainee artificial inseminators to practice on cows in abattoirs prior to them being slaughtered. For so called welfare reasons trainees are advised to only carry this procedure out on cows who will be slaughter the following day. This obviously implies that this procedure is distressful for cows, and that if they are to die the next day this than does not matter. Of course it matters, pain and distress matter at anytime and is not mitigated if the poor animal is to die the following day, pain and distress is still suffering for the animal regardless of the length of time that follows afterwards. Such is so obviously animal abuse, can you imagine mistreating your sick dog before he is put to sleep by experimenting on him, imagine if the local vet practised such procedures on your pet before putting him or her to sleep. And indeed don't forget these cows are sick, not of course that such would be acceptable even if they where not, suffering from the conditions described above and in addition, as already mentioned, 25 percent are slaughtered whilst pregnant! Such treatment demonstrates that these sentient beings are considered with as much concern and compassion to their welfare as car parts on a conveyer belt in a production line! Why is it okay to inhumanely commit such heinous atrocities on one animal, but it is a crime to do so upon another? No one would be allowed to cause the same suffering to pets that is carried out on farm animals with impunity. There is no such thing as animal welfare in farming, a term so liberally banded about, that involves suffering to animals in any way shape or form, including crowded dark and dank confinement, housed in pens with barely room to move, forced to stand in their own excrement, fed antibiotics, artificially inseminated, to remind you of just a few of the mistreatment to which cows and other farm animals are subjected, culminating in their premature and painful demise in the slaughter house. Tell me what is humane about that! The whole practice of rearing another creature to kill him or her is cruel, but perhaps the most cruel is the unrelenting abuse and misery of factory farming on sentient creatures who experience pain, both emotional and physical as do you and I.
I just could not stand the idea of eating meat - I really do think that it has made me calmer.... People's general awareness is getting much better, even down to buying a pint of milk: the fact that the calves are actually killed so that the milk doesn't go to them but to us cannot really be right, and if you have seen a cow in a state of extreme distress because it cannot understand why its calf isn't by, it can make you think a lot. The shocking examples of abuse cited above, and on the many websites of the animal rights organisations referred to here and in and the links section below, are wide spread, global. I was shocked though in my research whilst compiling this webpage to come across an article describing the abuse of cattle in India, which seems rather incongruous with the Hindu belief that cows are sacred. "When I was growing up in India, the images of happy cows were everywhere. The cows who wandered the dusty streets sometimes wore garlands, symbols of respect placed about their necks by Hindus or Jains. Not that life was easy for them. Overworked bullocks pulled carts through the clamor of city streets, breathing in the stinking diesel fumes, sweating in the searing India heat. Sometimes they collapsed under their burdens, and the drivers beat them with thick wooden sticks to make them rise and stumble on through the chaos. But there was a remnant of Gandhi’s reverence for life. Today, under heavy Western influence, it has vanished. When I returned to India with PETA colleagues this year, I found a thriving trade in beef and leather that means starvation, thirst, beatings, broken bones and cruel slaughter. There is no single culprit for the suffering: Hindus, Muslims, Christians and Jains are complicit in the trade, and the flesh and skin end up as far away as Asia, Australia, the Middle East, Europe and America." Sacred No More: Abuse of Cows in China and India Exposed. Unfortunately this article is now not available. your horns against my ear. Your massive cow face in my hands. I remember the experts said, “Watch out! But you have known people all of your life. But a bull with a broken pelvis can’t get to his feet. through my tears and yours. to flush out the pain. with all my aching heart. you could never pull a cart again. to feel the cool water on your velvet skin. and play games with Ganesh. the other walk on still. "This can't be happening to me!" hacking into cuts for the table. looking into my eyes without surprise. Fact: Humans are the only animal that continues to drink milk after they are weaned - the milk of another animal. Why cows milk? You would not drink dog or cats milk, it is unthinkable, ludicrous! Yet you drink cows milk, a mammal like your cat and your dog so it is just as bizarre. But few question this, many people are brought up to consider that it is natural and that is what cows are for, to provide you with milk. Fact: Approximately 75 percent of black people, and most people in Asia and 15 percent of white people are lactose intolerant (allergic to cows milk). Does that tell you something? Cows milk is not meant for humans. I think it is more than likely that many of us here in the west are lactose intolerant. When I was a child in the 1950s my parents where advised to eliminate milk from my diet due to chronic illness. Fact: A cows milk is for her calf only, not for you or for you to feed to your cat! Feeding your cat milk is as unnatural for him or her as it is for yourself and it is not good for cats anymore than it is good for you. Fact: cows do not naturally produce milk on a daily basis. They like humans only produce milk when they give birth to their calves and, like humans and all other mammals, that milk ceases to flow when her calf is weaned and until the next time she is pregnant she produces no more milk. Fact: synthetic growth hormones fed to cows have been linked to infertility in men, who as young boys drank lots of milk. Sadly erroneous advice was given many years ago when everyone was advised to drink one paint of milk per day and milk was given out freely at school to every child. Fact: Contrary to popular belief milk does not protect against bone fractures; milk's high protein content leeches calcium from the bones. Women who drank 3 glasses of milk a day had more fractures than those who rarely drank milk. Calcium is needed of course for sound bones and teeth, particularly when we are young and again when are old, however calcium may be derived from other sources. Including: Dried figs, Green leafy vegetables: spring greens, kale, broccoli, parsley. Baked beans, oranges, and white flour are also good sources. Food containing fair amounts of calcium includes brown bread, brazil nuts, dried apricots, French beans and sesame seeds. Contrary to popular belief it is now known that Milk consumption is not necessary to prevent osteoporosis, in fact it is quite possible that instead of preventing this condition milk may be one of the causative factors in its development Research has revealed that in populations that consume the most milk, the incidence of osteoporosis is the highest. To the milk critics, the shibboleth that osteoporosis is caused by calcium deficiency is one of the great myths of our time (each side accuses the other of myth peddling). Mark Hegsted, a retired Harvard professor of nutrition, has said, "To assume that osteoporosis is due to calcium deficiency is like assuming that infection is due to penicillin deficiency." In fact, the bone loss and deteriorating bone tissue that take place in osteoporosis are due not to calcium deficiency but rather to its resorption: it's not that our bodies don't get enough calcium, rather that they excrete too much of what they already have. So we need to find out what it is that's breaking down calcium stores in the first place, to the extent that more than one in three British women now suffers from osteoporosis. The most important culprit is almost certainly the overconsumption of protein. High-protein foods such as meat, eggs and dairy make excessive demands on the kidneys, which in turn leach calcium from the body. One solution, then, isn't to increase our calcium intake, but to reduce our consumption of protein, so our bones don't have to surrender so much calcium. Astonishingly, according to this newer, more critical view, dairy products almost certainly help to cause, rather than prevent, osteoporosis. "Yes... milk is Mother Nature's "perfect food" ...for a calf... until it is weaned. Most cow's milk has measurable quantities of herbicides, pesticides, dioxins (up to 200 times the safe levels), up to 52 powerful antibiotics (perhaps 53, with LS-50), blood, pus, feces, bacteria and viruses. (Cow's milk can have traces of anything the cow ate... including such things as radioactive fallout from nuke testing ... (the 50's strontium-90 problem)." Bessie What Happened To You? She grazed peacefully under the sun. For the ones that took care of her! Carrion usually feasted on the remains! They don't teach compassion & humanity in MBA courses! So what - kill it! Mix soya bran with Chicken manure!! Environment is unclean you know! We'll lose money if she gets sick! & Yes give it the bovine growth hormone! 100 pounds per day instead of 25 that God had planned! The cows udders are not meant to process so much milk! Pus forms, very painful for the cow! Meets regulation - ship it! Money is rolling in!! That's all that matters! Putting up 4000 herd dairy farm! Flies & vermin enter local water table all kinds of pathogens ! Green backs come!! Come!! But yes!! Ah! There's more money yet to be made!! Calf given 1 hour to three days to suckle!! With its aura of pain! Served as hamburger at the lunch counter!